Roasting vegetables in the oven at a high heat is one of the easiest cooking techniques, but it may transform the way you usually cook certain ingredients. This method requires little effort and time, yet pays off in richly browned and succulent vegetables with a deep, caramelized flavor that's hard to match—even kids will like some vegetables roasted that they never wanted to eat before! It's also a more nutritious cooking method, since vitamins and minerals are sealed into vegetables as they roast, instead of leaching out into cooking liquid as happens with braising or boiling. Get started with this way of enjoying vegetables and make over your dinner plate with the following irresistible side dishes. Turnips are transformed into tender, mild veggies when they take a trip into your oven at high heat. 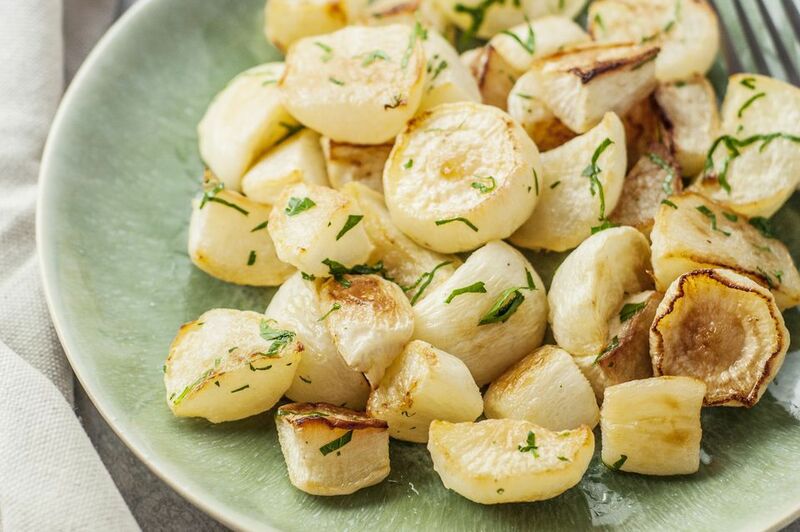 Olive oil and sea salt is all that's needed to dress them for the oven, but feel free to add herbs such as thyme or rosemary for extra flavor for these yummy roasted turnips. These quick oven roasted baby potatoes are made on a baking sheet with some olive oil, salt, and pepper, which is an easy way to imbue them with tons of flavor. Parboiling the potatoes first is the trick to getting perfect texture out of the oven. Making roasted onions in a hot oven mellows their sharp flavor, bringing out a luscious sweetness you have to taste to believe. A drizzle of high-quality balsamic or cider vinegar at the end of cooking further highlights that caramelized texture. Enjoy them with a good steak or as a side dish for roasted chicken. Diagonally sliced carrots and parsnips are tossed with olive oil, fresh snipped rosemary and sage, salt and pepper, before going into the oven, in this easy roasted carrots with parsnips and herbs recipe packed with cold-fighting antioxidants and vitamin C.
Cauliflower takes a trip to India in this Indian Spice roasted cauliflower dish, which calls for dressing up the everyday vegetable with aromatic spices. Shop for garam masala in Indian food markets or make your own spice blend with these tips. Patty pans are a small summer squash with a saucer-like shape, fluted edges, and buttery interior. This oven-roasted patty pan squash with shallots and herbs recipe calls for oven roasting the seasonal vegetable with shallots and herbs to make a dish that's lovely warm or cold. Roasting brings out the sweetness hiding inside parsnips, which come out caramelized and a bit crispy in this simple sweet roasted parsnips recipe with only three ingredients. Sage and onion wedges add depth to an easy roasted butternut squash dish that would make a great holiday side (toss in a few cranberries or pecans!). If the supermarket is out of butternut, a similar winter squash will do, such as acorn, buttercup, or Hubbard. A bit of bacon and a few cloves of garlic turn regular roasted Brussels sprouts into something spectacular. The combination of softened Brussels, tender garlic cloves, and crispy, oven-browned bacon bits truly can't be beat for this bacon roasted brussels sprouts recipe. Remember to remove the tough outer leaves of sprouts before cooking. Toasted sliced almonds give this delicious roasted cauliflower and quinoa salad extra flavor and a satisfying crunch, while peas and spring onions add a nice, vibrant freshness. Enjoy this salad for lunch, served warm or chilled on pea shoots, spinach, or other salad greens. If you're new to cooking artichokes, we're here to tell you it doesn't have to be complicated. Roasted whole artichokes in foil packets, with the simple additions of olive oil, lemon juice, salt, and optional garlic, brings out the best in the pretty vegetable. You can add butter to the packets, if you like, for extra creaminess. Here's a simple recipe that may forever change the way you prepare roasted broccoli and cauliflower. Oven roasting improves the texture and sweetness in these vegetable superfoods and removes the bitterness that's sometimes left after steaming or boiling. Olive oil, salt, and pepper, plus hot heat from your oven, is all that's needed to achieve this welcomed transformation. The humble carrot gets an elegant makeover in this savory-sweet side dish. Roasting carrots brings out their natural sweet flavor and the herbal aroma of za'atar, a classic Middle Eastern spice mix, is the perfect complement for this roasted carrorts with za'atar dish. Herb roasted red potatoes make a festive holiday side or a pretty addition to your dinner plate on weeknights. This recipe dresses them with olive oil and lots of fresh or freeze-dried herbs. Once in the oven, the spuds turn a crispy and golden brown. Make a batch of roasted red peppers in oil for your freezer and you will have a ready topping anytime for pizzas, sandwiches, and pastas. They will keep for up to three months in the freezer stored in air-tight plastic bags. This colorful dish is a great way to use up a bounty of zucchini and bell peppers from your garden or the farmer's market. The secret is a hot oven, which helps to caramelize the edges of the peppers and gives the vegetables a deep, rich flavor. This is a sophisticated way to enjoy the deep flavor of with a roasted vegetable tart. Savory-sweet potato, spinach, and caramelized onion drizzled with a balsamic reduction and encased in golden brown puff pastry makes an elegant starter for special occasions.